Why did it take the Police Ombudsman six years to report on a PSNI killing? A FAMILY’S wait for the Police Ombudsman to report on why their unarmed brother was shot dead by a PSNI officer will come to an end today (Wednesday) – nearly six years after the event and only after they threatened legal action. In an interview with the Detail, Neil Colwell, a brother of Steven Colwell speaks out about the lengthy delay in the Ombudsman producing the report on the killing and he asks why no one has ever faced charges over the shooting. The family also has questions about the fitness for duty of the officer who opened fire on that day. “As a family from a unionist background, from a loyalist background, we find it very, very hard to accept that this actually has taken place. Because from our tradition … we never experienced state oppression and we now see what the other side of the coin has been for a long time now." Steven Colwell was 23 years old when he was shot dead by a policeman in April 2006 as he attempted to reverse a stolen car away from a PSNI checkpoint at Ballynahinch, Co Down. 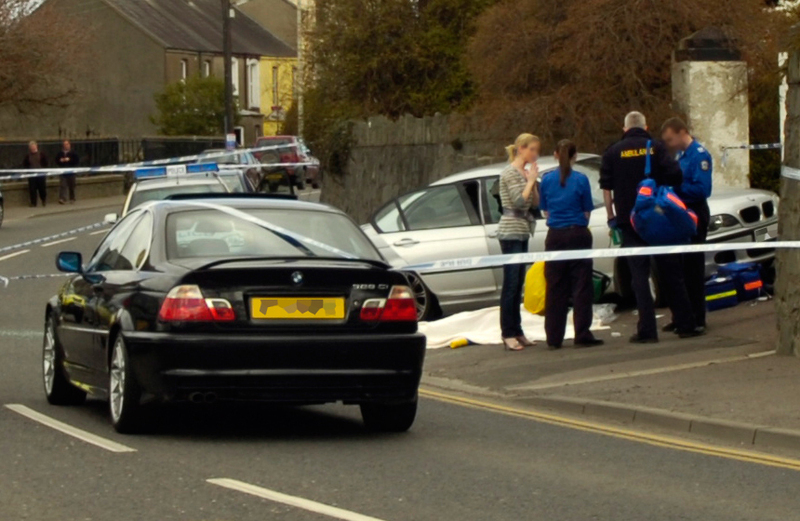 Police in Ballynahinch had been made aware that a stolen car was headed their way, pursued by a civilian vehicle. Steven was shot twice in the chest by a police officer standing directly outside the vehicle. It was a highly controversial incident with doubt cast immediately on whether Steven should have been shot. Some eyewitnesses claimed the 23 year-old clearly posed no danger when he was killed. But there were also conflicting reports; the DUP’s Jim Wells claimed at the time that Officer O only opened fire because he feared for his life and the lives of other people in the area, including a baby. The Police Ombudsman investigation into the killing was viewed as critical; a test of the quality of accountabilty for the new PSNI, unlike its investigations into incidents dating back to the conflict and actions of the RUC. It was the first time that a PSNI officer had shot dead an unarmed civilian, with no other firearm being involved in the incident. Neil Colwell and other members of the family made their own enquiries in the aftermath of Steven’s killing. Neil says: “I had spoken to the other occupants of the vehicle and I had asked them to tell the truth as to what happened that day. “What I must add was that two of the young females in the car were Catholic and that Steven’s girlfriend was from west Belfast. I had spoken to these people. The Colwell family say they reluctantly placed their faith in the Police Ombudsman, having been told at the time that the investigation would be timely and transparent. Nearly four years later – days before Christmas 2009 – the Public Prosecution Service (PPS) decided that Officer O should not face any prosecution. The family learned soon after that Officer O was back on duty within the PSNI. However the Detail can now reveal how a senior Police Ombudsman investigator had raised concerns that Officer O’s fitness to be in possession of a weapon at the time of the fatal shooting “may well have been in doubt”. The concerns, expressed by the ombudsman’s Deputy Senior Investigating Officer Paul Holmes, were expressed during a court hearing in 2007 when Officer `O’ successfully blocked the Ombudsman from obtaining his medical records from the PSNI. As part of the case it was revealed how Officer `O’ had previously been suspended from duty and had his police issue weapon withdrawn after being arrested and charged with assaulting and threatening to kill his partner. At the time the PONI team attempted to get hold of the medical records, `O’s legal team successfully argued that they had breached the policeman’s right to privacy by failing to inform him as to why it had sought access to his medical records. Despite the judge in the case telling the Ombudsman’s team that it was entitled to reapply for access to the policeman’s medical records, no new effort appears to have been made to access the records. Neil Colwell is highly critical of the handling of the issue of O’s medical records which he says highlights the questions to be answered by senior PSNI officers in this case. The Colwell family are also disappointed that they ended up threatening legal action against the Ombudsman because of its repeated refusal to publish the report into Steven’s killing. “The relationship between the family and the Police Ombudsman was initially positive. “We understood that the ombudsman carried out extensive forensic work in relation to their investigation which the family was very happy with. “I had the opportunity to discuss that matter with them as well and I was happy that they had carried out good work in that respect. “However over the last couple of years that relationship has broken down. “There has been broken promises, there has been further delay, a year and a half ago, almost two years ago the family was told the report as almost complete and here we are today we still don’t have the report. “There has been a big frustration and a breakdown in the relationship between the family and the police ombudsman.